Address 401 Main St. S.
Short Business Description: Coldwell Banker All Points-Festival City Realty has all points covered in Huron and Perth Counties for all your real estate needs. Whether it’s residential, business, agriculture or leisure or you’re selling your home, Coldwell Banker All Points-Festival City Realty are there to help you from opening to closing. Address 417 Main St. S.
Short Business Description: Realty Executives Platinum handles all types of real estate with offices located in Huron County. 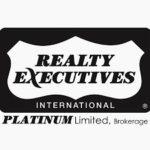 Whether it’s residential, commercial, multi-family, or farm, Realty Executives Platinum believes excellence must be at the forefront in all facets of real estate. Address Royal LePage Heartland Realty, Brokerage has been assisting customers and clients buy and sell properties with 6 offices across Huron County. The realtors at Royal LePage Heartland Realty can provide expert advice to buyers and sellers in residential, agricultural, commercial and recreation real estate. Short Business Description: 305 Main St. S.